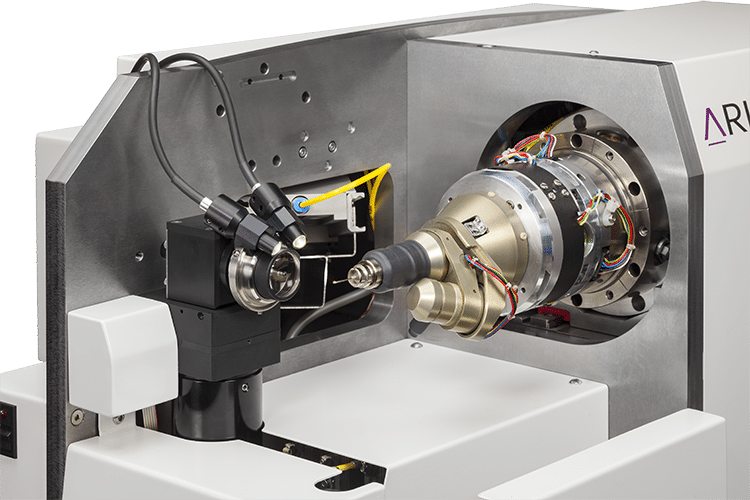 The Mini-Kappa MK3 is a multi-axes goniometer head for MX crystallography beamlines. It purveys additional κ & Φ axes, giving numerous possibilities of crystal reorientation. The Mini-kappa MK3 is a co-development of Arinax & the EMBL Grenoble Instrumentation Group (Cipriani team). Travel Range: 0 to 48°. Value depends of the kappa-axis’ position. This video presents the Mini-Kappa Goniometer head mounted on a MD2-S microdiffractometer. The Mini-Kappa is dedicated to MX crystallography synchrotron beamlines. It purveys additional Kappa & Phi axes, giving numerous possibilities of crystal reorientation. 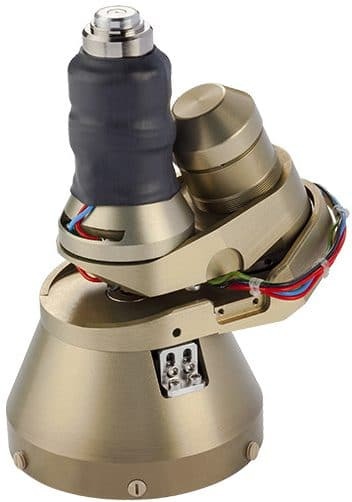 The Mini-Kappa MK3 is a multi-axis goniometer head with reduced dimensions that purveys additional κ & Φ axes, giving numerous possibilities of crystal reorientation. It reaches a rotational precision of ±0.05° for κ axis & ±0.09° for Φ axis and can be equipped with the SmartMagnet sample holder. Mounted on a MD3 High Precision X-ray diffractometer with an UP configuration, the Sphere of Confusion (SOC) that is achieved on the Ω axis is 100 nm. The mini-kappa MK3 considerably optimizes the data collection process by reducing the redundant protocol steps: it limits the number of diffractions needed to complete the data collection and avoids spot overlaps. Thanks to the additional kappa & Phi axes rotation, X-ray diffraction isn’t limited to one “crystal frame” but is realized on the entire crystal: the diffraction is more distributed over the crystal, limiting radiation damage. Needed Volume that includes the Mini-kappa MK3 and the free space required for kappa movements is contained in a cylindrical volume with exceptional compact dimension of 120 mm length and 131 mm diameter. The Mini-kappa MK3 is able to detect potential risk of collision with equipment, such as a robotic arm (e.g. Staubli robot). If an obstacle is on the path of the kappa movement, the integrated detector initiates the “Omega Stop” safety sequence: the kappa movement is stopped and information is conveyed to the beamline terminal. The Mini-kappa MK3 can be mounted on Arinax diffractometers, such as the MD3 & MD2-S x-ray microdiffractometers. The Mini-Kappa can also be compatible with other equipment. 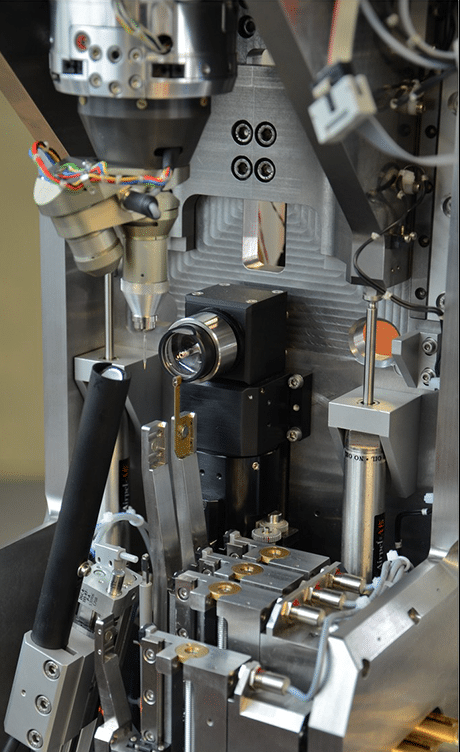 Designed for modern MX crystallography beamlines, the Mini-kappa MK3 is compatible with sample changer robot using a vial or a gripper transfer, such as the 6-axis sample changer robots. 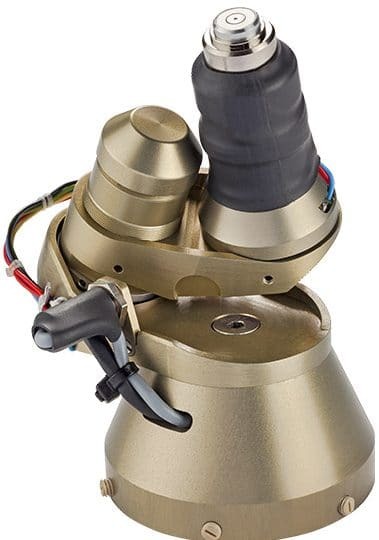 In order to give the best flexibility to users, the Mini-kappa MK3, the Plate manipulator and the SmartMagnet are designed to be easily mounted and dismounted according to user need: the switch from one to another takes about 5 minutes and only one person is required to do the switch. Angular Range/Travel range 0 to 48°. Kappa-axis position dependent.